We’re sitting on the expansive roof deck of El Cocinero, a restaurant and fashionable gathering spot carved out of an old cooking oil factory that serves its white potatoes bravas style — a sure sign we are in an international-economy outpost in Cuba, rather than a local-economy joint. Entered by ascending a spiral staircase up a former industrial smokestack, the restaurant is identified from the outside with a sign on the artfully lit brick chimney, which anchors a tiled patio with mod white fiberglass chairs encircling white tables and red banquets lining the walls. A press of a button and canvas tarps pop out when the sky threatens rain, sheltering diners so they don’t get wet in the December squall. Oppmann has for the past four years been CNN’s man on the ground in Havana. He’s also, as @cubareporter, the most widely followed single-topic Instagrammer on Cuba, garnering more than 56,000 followers across the globe, many of them Cuban emigres eager to see what their nation of origin looks like today. Instagram in most parts of the world acts as a keyhole into the real (or at least “real” in the reality TV sense) lives of regular and famous people alike, allowing them to show an audience their otherwise unseen interior worlds and day-to-day lives. Like many things in Cuba, though, Instagram on the Caribbean island is the opposite of everything you thought you knew about how media works. Rather than being a view into the interior life of the people of this long isolated nation, the dominant forces in the Cuban Insta world are foreigners based there — outsiders looking in and trying to help the rest of the world see in too. To talk about Instagram in Cuba is to very quickly move from admiring gorgeous imagery of old cars and older buildings into a discussion of state restrictions on speech and communications technologies in the nation that has the lowest mobile phone penetration rate in Latin America and steep government and economic barriers to digital access. Oppman’s wife, Panama-born Alexandra Oppmann, also maintains an Instagram account about life on the island, the more personal @cubajournal, as well as @almacubashop, a feed for the chic shop she runs selling local handmade goods. 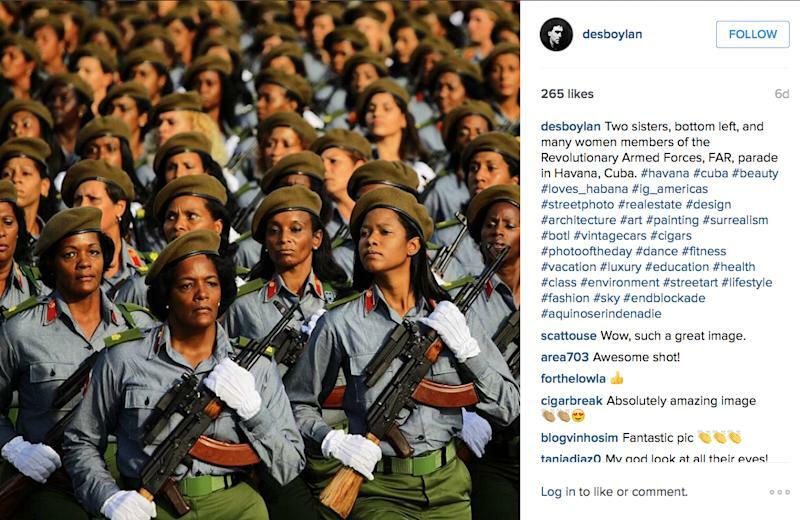 Together with @desboylan, run by Havana-based Reuters photographer Desmond Boylan, an Irishman, and @eliaponte, run by Colombia-born former Reuters photographer Eliana Aponte, they comprise some of the top ’grammers working from Cuba. The man behind @aprespinosa, Ramon Espinosa, an AP photographer who recently launched an account, hails from Spain. 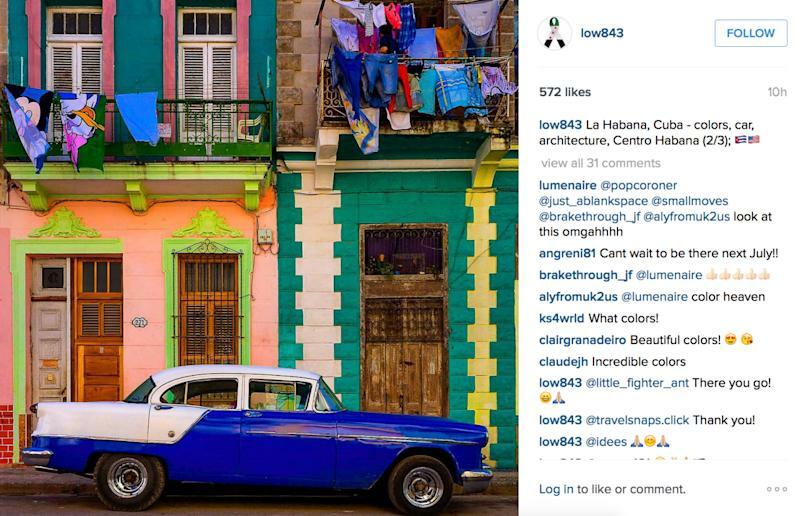 Another of the big accounts showcasing images of Cuba, @low843, is actually run from South Carolina by attorney Michael Petit, who fell in love with the country in 2013 and has been there 13 times since to photograph it and talk to people. Thanks to the formidable technological obstacles — not to mention concerns about drawing government attention — there are fewer Cubans seeking to build Insta followings about Cuba, and their accounts are newer. Roberto Suarez, @cubaenfotos, a photographer for the Cuban communist paper Juventud Rebelde, is one who has drawn more than 3,000 followers. Award-winning independent journalist Yoani Sanchez, based in Havana and in 2014 a Yahoo fellow at Georgetown University, has more than 28,000 followers for her @yoanisanchez account. There are also some group accounts, curated from photo submissions, with more than 10,000 followers, and professional travel agencies, such as @havanatur, draw their share. But many individual accounts still have few followers. 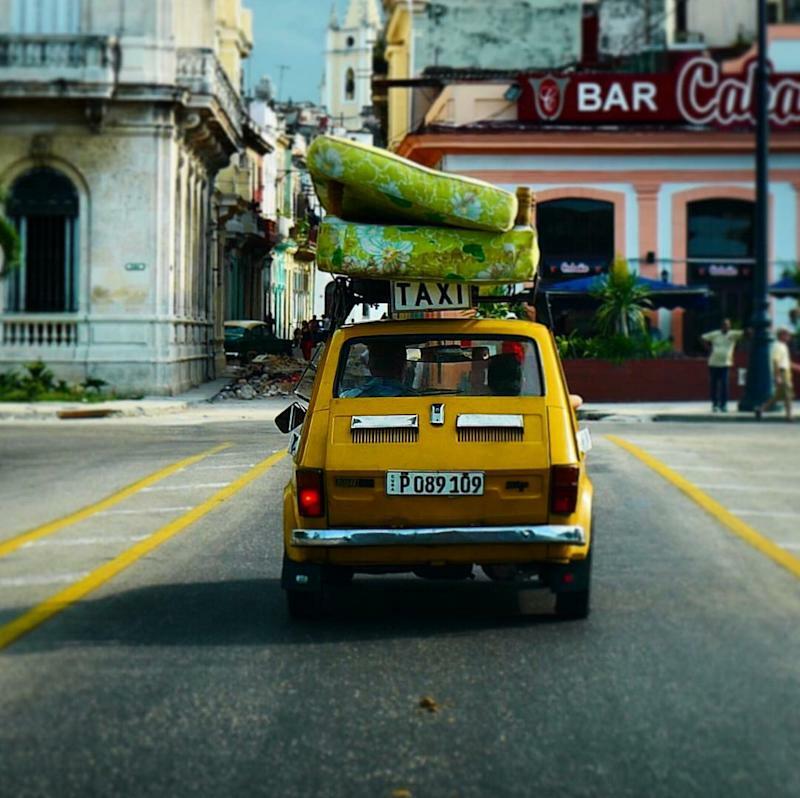 Instagram in Cuba, “by and large, it’s in its infancy, which is incredibly sad because you’ve got people who are incredibly creative and who are great photographers,” says Oppmann. Abutting El Cocinero is La Fabrica de Arte Cubano, or FAC, a multilevel art gallery and music and performance space that acts as a bit of a nightclub for well-heeled Cuban hipsters. Some of the work of those extraordinary photographers is on display in the FAC’s many galleries, but thanks to the minimal penetration of social media, little of it is visible to outsiders. 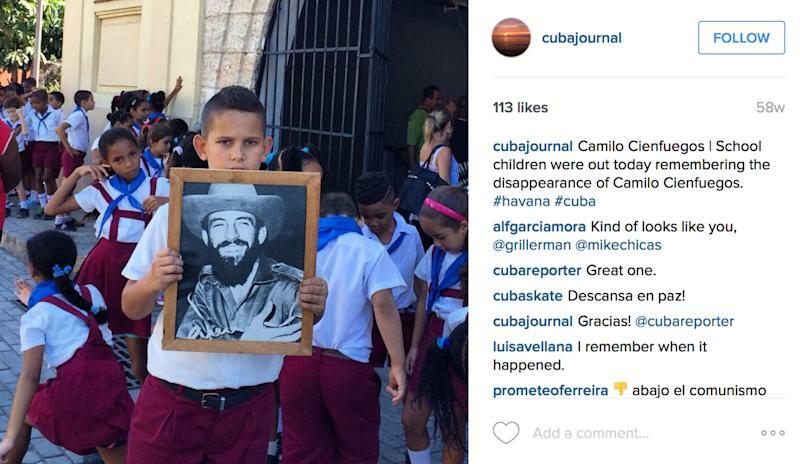 There are three substantial impediments to the growth of Instagram in Cuba. Home Internet access on the island is available only with a license from the Ministry of Communications and costs hundreds of dollars a year, not counting such equipment as a Wi-Fi router for home mobile use, in a country where the average monthly wage for government jobs is $20 — and almost all official jobs are government ones. This means the only people with home DSL lines — the top of the line technology available in Cuba — and home Wi-Fi are journalists, diplomats and a handful of Cuban elites. Moreover, those hot spots — where Cubans and tourists can be found fanned out like birds on a wire on sidewalks — are all exterior to buildings. That’s a bad scene for using expensive and hard-to-come-by technology when it rains, in a country that has a rainy season, and not always safe at night, either. Even so, it’s an improvement from just a few years ago, when all communications with the outside world had to go up through Russian and Chinese satellites and Wi-Fi costs were upwards of $10 CUC (one of the two local currencies) an hour. There’s now an underseas communications cable connecting Cuba and Venezuela, and costs for an hour of Wi-Fi have dropped to just $2 or $3 CUC — a price still too high for most Cubans, but a welcome decline nonetheless for those who can swing it. And then there is the critical question of the risk of making oneself publicly visible. “You’re Cuban and you’re putting yourself out there — the hardest thing. It maybe invites criticism. It maybe invites scrutiny,” says Oppmann. Identity branding online is as American as the chain stores unlikely to get approval to open on the island anytime soon. And while the government can look the other ways as new creative endeavors take hold, as they did with private cinemas that once sprang up to show movies from abroad, even what is quietly tolerated by the regime for years can quickly become anathema. “Private businesses that get too trendy get shut down. Home theaters were very popular for a time … and then someone showed a movie that the government didn’t want shown. Everyone got shut down,” recalls Oppmann. Now it’s just official government theaters again, although the FAC was screening an episode of “Game of Thrones” on an enormous screen the night I visited it. Still, as a visual medium Instagram could take off on the island in a way political, pugnacious Twitter seems unlikely to. “A photo, you can put a description on it, no description – and it says it all,” says Oppmann. Instagram is seen by many in America as the last happy place on the Internet, and it seems inevitable Cubans will one day use it the same way so many do internationally — to showcase what is beautiful and extraordinary, or what they want to remember and celebrate, if and when the access questions become less acute. “All the raw material is there to have an Instagram star from here. Nothing would make me happier,” says Oppmann.